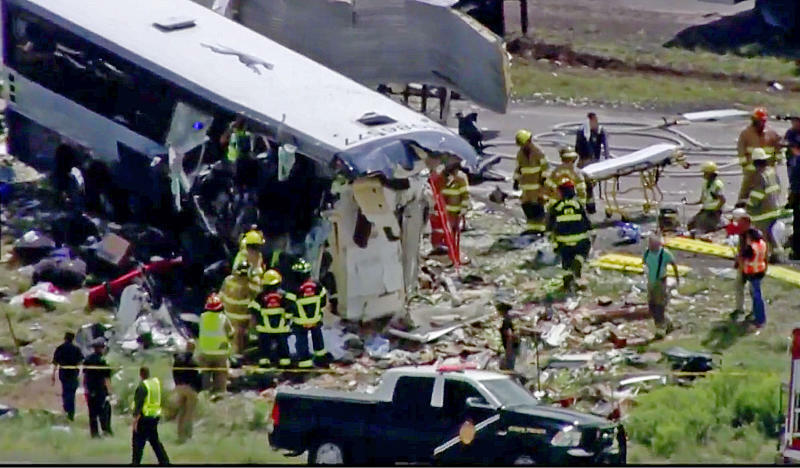 ALBUQUERQUE, N.M. (AP) — At least four people were killed and others were seriously injured Thursday in a head-on crash involving a commercial passenger bus and a semi-truck along Interstate 40 in New Mexico, near the Arizona border, authorities said. 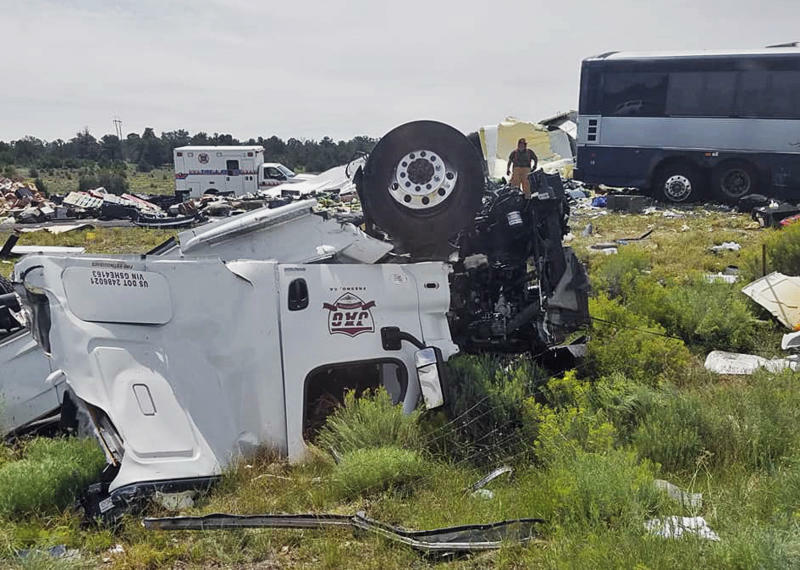 Preliminary information indicated the semi was headed east when it blew a tire, sending the rig across the median and into oncoming traffic where it smashed into the bus, New Mexico State Police said. 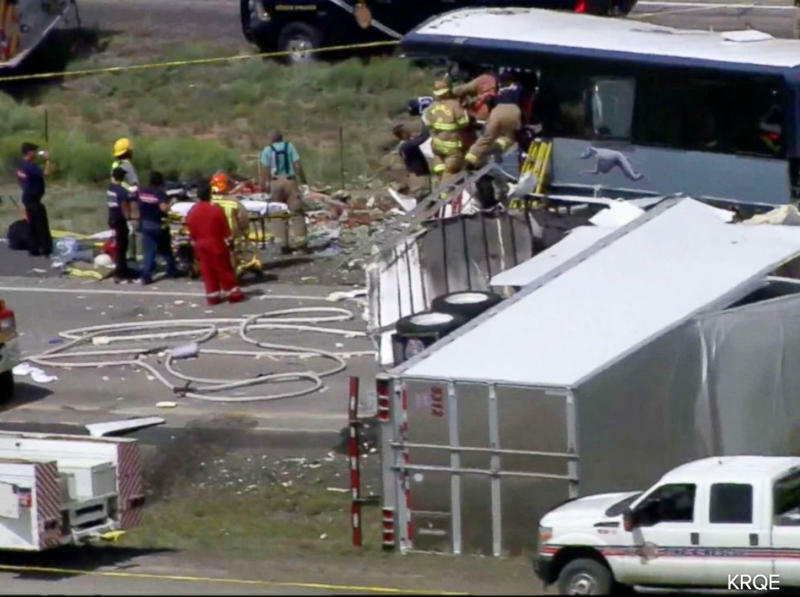 There were 49 people aboard the Greyhound bus. Authorities said many were transported to hospitals, but they could not immediately provide an exact count of how many were hurt or their conditions. Nine bus passengers were being treated at University of New Mexico Hospital with three more patients expected to be transported there later Thursday. UNM officials didn't release any details about the patients' conditions. Eric Huff was heading to the Grand Canyon with his girlfriend when they came across the crash. Huff said the semi's trailer was upside down and "shredded to pieces," and the front of the Greyhound bus was smashed, with many of the seats pressed together. Part of the side of the bus was torn off, he said. "I was really traumatized myself, because I've been driving about two years and I had never seen anything like that before," Soto said. "I'm a pretty strong person and I broke down and cried for at least 30 minutes," he added. "It was intense," Jones said. Greyhound said the bus was heading from Albuquerque to Phoenix. "We are fully cooperating with local authorities and will also complete an investigation of our own," Greyhound spokeswoman Crystal Booker said in a statement.